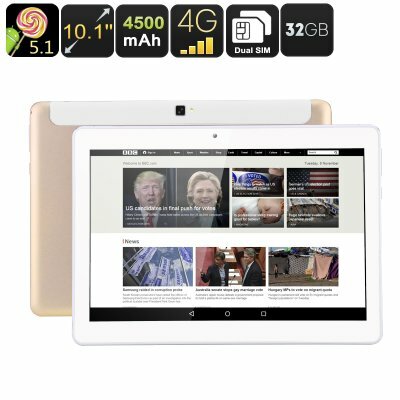 Successfully Added 10.1 Inch Tablet PC - Dual-SIM, Quad-Core CPU, OTG, Android 5.1, 32GB Memory, 4500mAh Battery to your Shopping Cart. Enjoy countless hours of fun and mobile entertainment with this magnificent 4G tablet. Featuring a stunning 10.1 inch HD display this Android tablet lets you enjoy all your media and games in breathtaking quality, truly lifting your mobile entertainment experience to another level. With its Android operating system this tablet PC offers a smooth and fast user experience that lets you enjoy the latest features the mobile industry has to offer. So sit back and relax as with this Android tablet computer at hand you will never experience a moment of boredom again. Featuring an ultra-fast Quad-Core CPU that has been clocked at 1.3GHz this tablet computer is sure to handle games, movies, and apps without dropping a frame. Its Mali-T720 graphics unit allows you to play graphically demanding games and watch HD video’s in stunning beauty – truly bringing all media to life at the palm of your hand. 2GB of RAM additionally makes this tablet a great tool for multitasking, so whether you like to play games, browse the web, stream online movies or multi-task for work – this tablet will handle whatever you throw at it. Featuring two SIM card slots and DUAL-IMEI numbers this 4G tablet allows you to make phone calls and be connected to two different 4G network providers. Browse the web with lightning speeds and download files in the blink of an eye – with this Android tablet a slow and laggy internet connection will be an issue of the past. With its two IMEI numbers, you will additionally have the possibility to make and receive phone calls on two different phone number simultaneously, ensuring that from now on you’ll always be connected no matter where you are. With its 0.3mp front facing camera you will be ready to make high quality video calls at any time of the day. Coming with 32GB of internal memory this tablet computer offers oceans of space for you to store all your media and files. From now on you can head out on your next road trip with confidence as with this Android tablet you will be able to carry along hour’s worth of mobile entertainment and fun. With a massive 4500mAh battery that offers numerous hours of usage time you, furthermore, don’t have to worry about running out of juice as this tablet PC will take you through a day’s worth of entertainment with ease. Additionally, this Android tablet computer features OTG, allowing you to connect external hardware devices such as a keyboard, memory pen, or game controller to your tablet – further enhancing your overall user experience. This 4G tablet comes with a 12 months warranty, brought to you by the leader in electronic devices as well as wholesale electronic gadgets..
Arabic: - 10.1 بوصة الروبوت اللوحي - Chinese Simplified: - 10.1 英寸的 Android 平板电脑 - Czech: - 10,1 palcový Android Tablet - Dutch: - 10,1 inch Android Tablet - French: - 10,1 pouces Android Tablet - German: - 10,1-Zoll-Android-Tablet - Hebrew: - 10.1 סנטימטר אנדרואיד לוח - Hindi: - 10.1 इंच एंड्रॉयड टैबलेट - Hungarian: - 10,1 hüvelykes Android Tablet - Italian: - 10,1 pollici Android Tablet - Japanese: - 10.1 インチのアンドロイド タブレット - Korean: - 10.1 인치 안 드 로이드 태블릿 - Malay: - Android Tablet 10.1 inci - Norwegian Bokmål: - 10.1 tommers Android tablett - Romanian: - 10.1 inch Android comprimat - Russian: - 10,1-дюймовый Android Планшет - Spanish: - Tablet Android 10.1 pulgadas - Thai: - แท็บเล็ต Android ขนาด 10.1 นิ้ว - Turkish: - 10,1 inç Android Tablet - Vietnamese: - 10,1 inch Android Tablet. Amazing tablet and 4g compatible in Europe for an amazing price. The tablet arrived quicky. The tablet is fast. Good sound. Could make calls with it and download my apps, listen to music and watch my home made films. Thanks Chinavasion for this amazing product.